100% Design September is finally here! From 20th to the 23rd of September, this outstanding trade show is going to take over London Design Festival with its amazing exhibitors and innovative design that is going to conquer the interior design world. Today we are going to show you what is happening and everything you have to know about this furniture fair! Ready? Just keep scrolling and get inspired! YOU MIGHT ALSO LIKE: WHERE TO STAY IN LONDON DURING THE LONDON DESIGN FESTIVAL! The biggest date on the London’s furniture and lighting calendar has fallen today, marking the start of 100% Design September. London is the place to be right now more precisely Stand L421, where you will find DelightFULL and its unique lamps. In this year edition, the lighting brand will be presenting new designs are coming. With this year’s theme ‘Elements’, DelightFULL will show pieces that best represent the craftsmanship and materials involved in the production of the lamps. Mullan lighting is another luxury brand that is shining with its lighting designs in this incredible trade show. 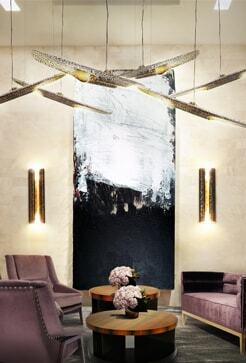 “Whether in a figurative or literal sense, light has always been the element of choice when eradicating or navigating through dark environments.” By way of his travels, Mullan lighting brings his many design influences to life in the form of beautifully handcrafted luminaires for the world to enjoy. Designheure is also bringing light to London. The brand created the link between the French industry and designers, striving to represent French chic and elegance. Each year Designheure launch new collections that are simple, elegant and ingenious and this year is no exception. Finally, we highlight the presence of Original BTC that has an outstanding stand that represents everything that the brand stands for. Quality, detail and an interesting mix of materials is everything we assure you will find in every single brand’s designs.